The String® system has been modern since 1949. 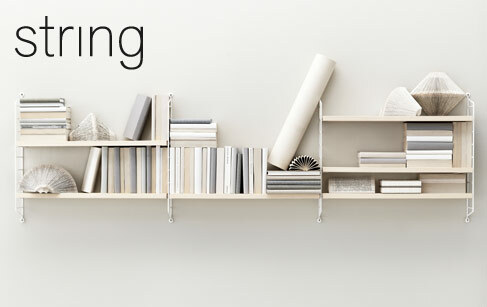 A veritable Scandinavian design icon, the String modular shelving system was created in 1949 by the celebrated Swedish architect Nils Strinning (1917 - 2006). In the beginning the String shelving was designed as part of a competition run by the Swedish national library and Swedish manufacturers Bonnier. The challenge was to design the perfect bookcase for every home in Sweden. It had to be practical, cheap and easy to assemble. Nisse Strinning thought up a system that was simple - two mounts in iron wire into which one simply inserts the wooden shelves at the desired height, without the use of tools. The whole thing is light and flat-packed so really easy to transport from the shop to home. Nisse Strinning was the runaway winner of the first prize in the competition. A true pioneer, he paved the way notably for the distribution of cheap self-assembly furniture, something that was really needed in the post war era and in limited living spaces. Still today, the String shelving unit continues to be manufactured in Sweden in order to preserve the quality. The design has been unchanged since 1949. Perfectly adapted for contemporary living, the system is made up of shelves which are completely modular and can be easily combined and transformed to suit each person's needs. Its lightness, adaptability, and minimalist timeless design has made it one of the great classics of Swedish design. The String range has grown with the introduction of new colours and modern materials like Plexiglas.